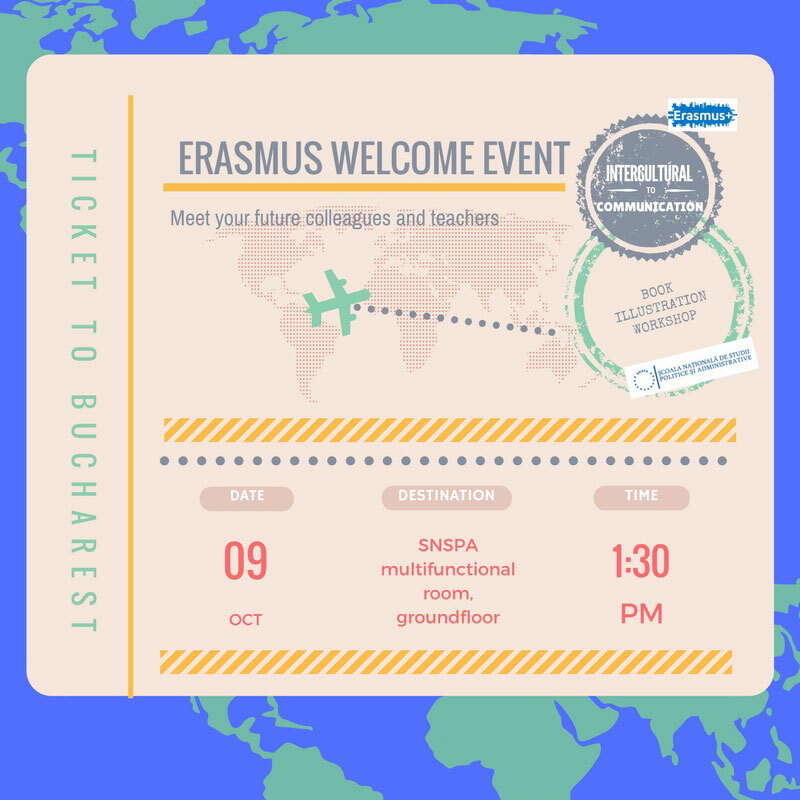 On 9th of October, starting with 13.30 all our Erasmus+ students are invited to a welcome event held at SNSPA. 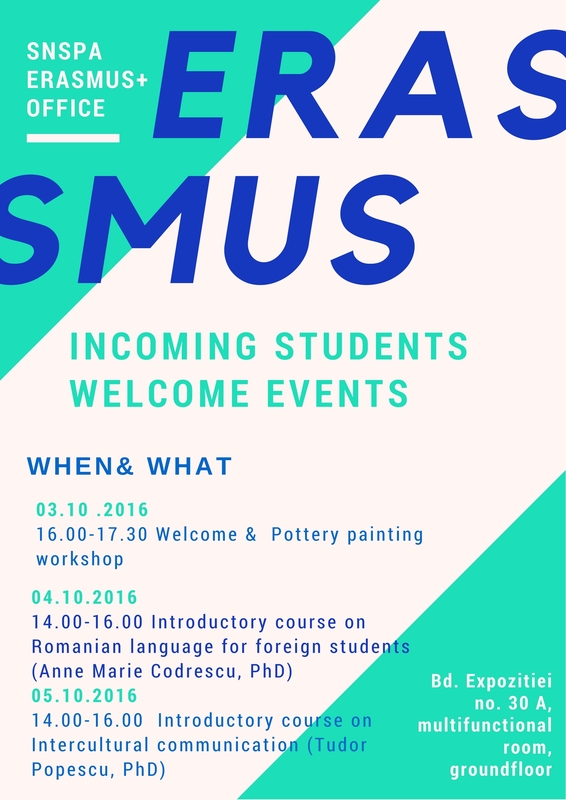 This event will be about meeting other Erasmus+ students at our university, as well as Erasmus+ coordinators. Transition to the life of an Erasmus student will be facilitated by a course on Intercultural communication (14.00-15.00) delivered by Tudor Popescu. In order to have a little bit of fun and to get a grasp of local creativity (and your own) we have prepared a special book illustration workshop (15.00-17.00) during which students will explore the way in which colors are emphasizing the meaning of words. It will be hands on, ink & paper approach, of course. All activities are held at National University of Political Studies and Public Administration (Bd. Expozitiei no. 30A) in multifunctional room, located at ground floor. During the month of October, the Erasmus students coming to our University will have the opportunity to attend a series of activities organized within our faculty. Meeting new colleagues and getting acquainted with bits of local culture & language are amongst the benefits of one attending these events. For details, please check this document. The College of Communication and Public Relations (CCRP) within the National University of Political Studies and Public Administration, Bucharest, Romania was established in 1990 and offers one of the best programs in communication and public relations in Romania. The College of Communication and Public Relations offers for incoming students courses taught in English in the field of Communication, Advertising, Project Management and EU Communication and Governance. The MA program in Project Management is the first one in Central and Eastern Europe in receiving the PMI accreditation by PMI Global Accreditation Center for Project Management Education Programs (PMI GAC). Since 2012, this MA program is affiliated to Academic Network Student Membership Program. The professors involved in the program have substantial teaching experience and have designed and participated in many educational projects at both national and international level. Their extensive research and teaching background is confirmed by their enrolment in numerous research projects and academic activities, among which the Fulbright research grants, doctoral and postdoctoral scholarships, international conferences, exchange programs, summer schools, etc. The courses are designed to meet students' needs and current interests in the theory and practice of communication-related areas. The program provides core and specialized courses in areas such as: communication and public relations, language and communication, human resources, project management, organizational communication, political communication, new media, advertising, etc. Incoming Erasmus students have to fill in the application form and the learning agreement. These documents have to be sent to the International Relations Office, College of Communication and Public Relations (CCPR) no later than June, 30 (incoming students for the 1st semester), and November, 30 (incoming students for the 2nd semester). The European Programs Office and the International Relations Office will take care of the incoming students both from administrative and academic perspective. Before the beginning of the semester, there is an orientation meeting with all the Erasmus students, guiding them through all the procedures. In order to have a better integration of the incoming students, we also try to assign an "Erasmus Buddy", a Romanian student, usually a former Erasmus student. Support is also provided by students' associations, especially by our partner ESN ASE. The CCPR offers accommodation in its two dormitories to a limited number of students. Foreign students have priority if they apply for a place in the dorms. If not, during the orientation week assistance is provided for those who wish to seek for a room to rent. Estimated cost of the rent: FCPR dormitory (all facilities included) 65 EUR/month; privately rented flat 300 EUR/month for a 2 bedroom flat; facilities (privately rented accommodation) 100 EUR/month. In Bucharest, there is a rich network of specialist hospitals, health centers, physician offices of all specializations, dentistry and prosthetic health centers and offices. Students from EU member states entitled to a temporary stay on the Romanian territory should have the European Health Insurance Card (EHIC) issued in their home country. In case it is not possible to obtain the above mentioned card it is necessary to purchase medical insurance individually. Citizens of EU countries do not require a student visa to enter Romania. They can enter Romania with an ID document (a valid travel document e.g. passport, or another document certifying identity and citizenship). Non European Union Citizens are required to apply for a student visa prior to leaving their home country. Applications should be made at your nearest Romanian Consulate. For further information on the visa regulations, please check the Romanian Foreign Affairs' Ministry website (www.mae.ro). The books and journals available in the CCPR library cover areas such as communication studies, advertising & public relations, political science and political communication, sociology, philosophy, critical theory. Students may access international databases from computers located in the FCPR headquarters. Foreign students can borrow books using their student ID card. For incoming students a Romanian language and culture class is being organized for whole academic year. The class has 5 ECTS. The course is organized on request.